← Podcasts – Trailer released!!! What do you get if you put the UK’s number one Cheryl Cole impersonator, an accordion player who grew up dreaming of a life on the ocean wave, and some of London’s hottest intellectual talent in one room? 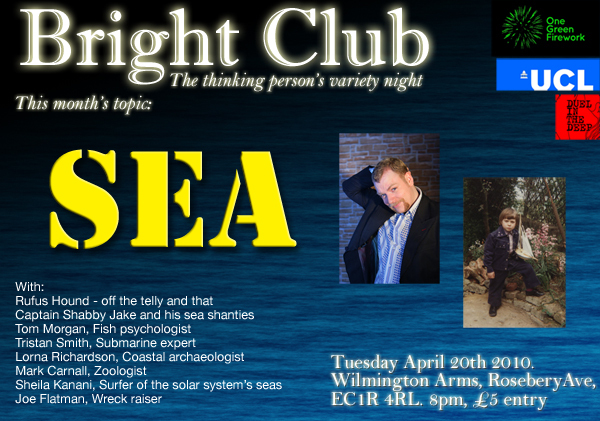 Oh yeah, Bright Club: SEA! Rufus Hound, who has the facial hair of a norwegian whaler and the tales to match. Shabby Jake, the accordion player with brine in his veins. Tom Morgan, who knows how long a goldfish’s attention span really is. Tristan Smith, who is the man you should consult before choosing your next nuclear submarine. Lorna Richardson, who digs in the estuaries of rivers, and sometimes ends up in the sea. Sheila Kanani, who has seen the seas on Saturn’s moons (and was slightly impressed). Mark Carnall, who knows all the animals of the sea, but can’t speak to them. Joe Flatman, who used to go down on old wrecks (fnar). Tom Morgan, who knows how long a goldfish’s attention span really is. Oh. Same as mine, then. The gig’s at the Wilmington Arms in Clerkenwell, costs a fiver, and will hopefully be full of lovely people. We’ll be taking most of this lineup to Brighton in May, for the festival fringe. Can you handle it?